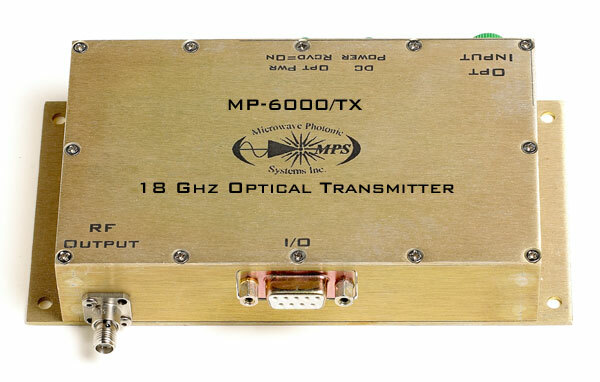 The MP-6000 Series is a stand alone RF over Fiber Link consists of individual Transmitter and Receiver. It’s designed for antenna remoting and broadband RF transmission applications using singlemode fiber optic cable. The transmitter uses a high efficiency Distributed Feedback (DFB) laser diode with an operating wavelength of 1550 nm that provides low noise and high dynamic range performance. The transmitter’s temperature stability is controlled with the use of a temperature compensation network. The transmitter provides status monitoring through the use of an onboard processor that communicates with a host computer over an RS-232 I/O interface. The I/O parameters include laser bias current, temperature and alarm status. When the MP-6000TX RF/Fiber Optic Transmitter is linked with the MP-6000RX 18 GHz RF/Fiber Optic Receiver, the combination provides an excellent choice for your ultra-wideband RF to Fiber Optic conversion applications.